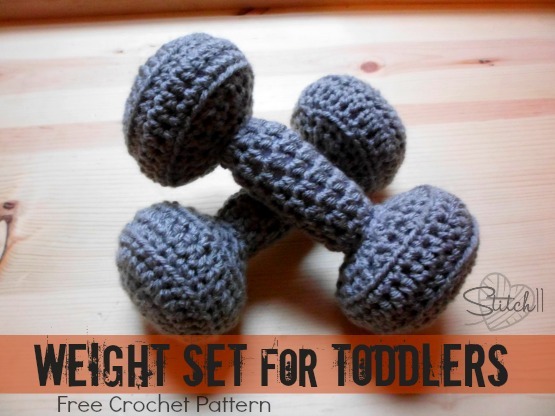 If you have ever had children, you will understand why I crocheted this weight set. Every-single-time I try to work out, my toddler wants to climb over, under and around me. She does her best to trip me… even if it means using her head. Recently, she discovered my small weights. I told her she isn’t allowed to use them because I was scared she would drop them on my toe. Yes, I said MY toe. Chances are- I would get hurt waaaaay before she actually would. Here is a photo of her demonstrating how to use the weights for the most outcome. I sure wish I had her energy! Finish off and weave in your ends. Stuff with fiberfill or scrap yarns. Repeat rounds 1-10 for other end of weight. Now it is time to crochet the middle of the weight. Finish off leaving long tail for attaching to the other end. Stuff the middle before attaching both ends. 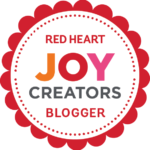 I think I might just have to make some for bub with bells in it – a weight shaped baby rattle! Sure to entertain bub AND daddy who works out with weights! Love the idea of adding noise to them, I think I’ll do the same! Thanks! Very clever! I must make some for my grandsons. Your daughter is very photogenic! That is the cutest picture of your little one with her weights. She looks so happy and fit!!! So how do you connect all the pieces together? Using a yarn needle and your yarn ends. How did you make it so seamless! So cute! What a great idea. And these will be perfect for a project I have to do for my Early Childhood Education class. Thanks!